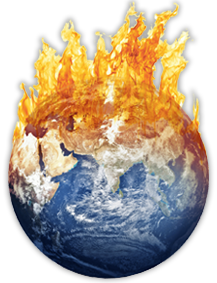 The Arctic is thawing very rapidly, documented by new reports from scientists and arctic natives. 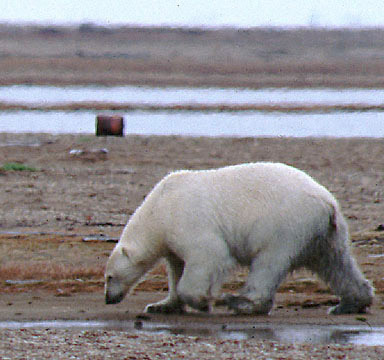 The Arctic Climate Impact Assessment was released in late 2004, and shows changes from the ice at the North Pole to animals and human settlements. More recent reports from Greenland show outlet glaciers moving meters per hour and rapidly thinning. The Arctic Ocean ice cap is shrinking in summer to the smallest it has ever been in modern measurements, and even winter cold has not been refreezing it as extensively as before. That sea ice is habitat for the polar bear. Declines in bear nutrition, birth weight and survival have moved the U.S. government (urged by three environmental groups) to propose the bear be named a species threatened with extinction. 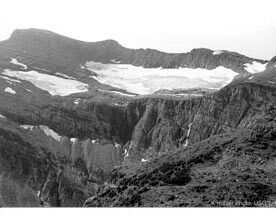 BEFORE: Take a look at Agassiz Glacier, in this photograph taken in 1913, near Boulder Pass, Glacier National Park. 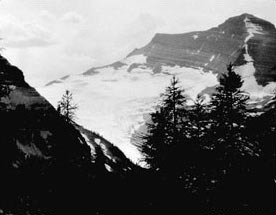 NEXT IMAGE: Agassiz Glacier (2005) Click to enlarge. 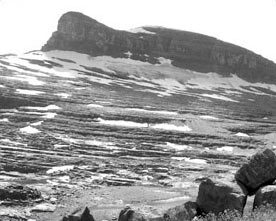 BEFORE: Shown above is a picture of Boulder Glacier, taken near Boulder Pass, Glacier National Park, in 1932. The foreground rocks provided an excellent reference point to re-photograph the historic photo. 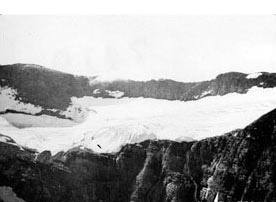 AFTER: Boulder Glacier photographed from nearly 73 years later from the same place as the 1932 photo. The foreground rocks provided an excellent reference point to re-photograph the historic photo. 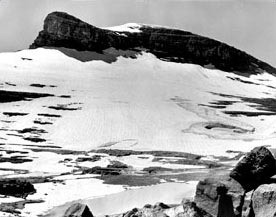 BEFORE: Photograph of the Swiftcurrent Glacier, taken in 1900 from the Swiftcurrent trail, Glacier National Park. 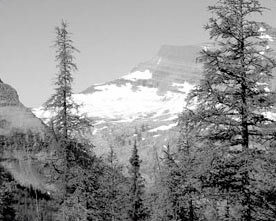 AFTER: Photograph of the Swiftcurrent Glacier, taken in 1988 from the Swiftcurrent trail, Glacier National Park.